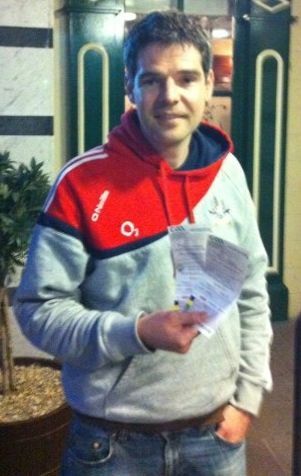 We have a winner of the all-Ireland Final tickets - it was a sign! Padraig Whelton, who supports Barryroe GAA club in Cork from his home in Dublin, by playing their Lotto Online, was the winner of the two tickets to the All Ireland Final. The draw took place in the locallotto.ie offices on Friday 17th September 2010 at midday. Turns out that is was a sign of good things to come for Cork people when Padraig won the two tickets to the All Ireland Final. His native county went on to emulate him by winning the 2010 All Ireland Football final. Congrats to the Cork team. MyClubFinances.com and Locallotto.ie reqularly run prize draws for those who are supporting their Club or Society Online. To be in with a chance to win all you need to do is be an active online Lotto player for your Club or Society on locallotto.ie. If you are an expired player just re-new your ticket and you'll be in the draw. If you are a current player, you do not need to do anything, you'll already be in! Draws will take place in the locallotto.ie offices at midday on the closing date of the draw and the winner(s) will be published on locallotto.ie and also called by telephone.